One of the most colorful and interesting people I know is an artist from BC, Canada who goes just by Violette. She lives in a magical house that is a rainbow collage of creativity both inside and outside! She has a new book Journal Bliss which is filled with ideas and techniques to creating your own delightful, color filled personal journal. Her book reaffirms that we are all artists and writers with our own individual style. It is just about picking up the colored markers, pencils, crayons and just start! Her book will get you inspired to "journal your own Bliss". 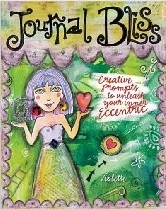 What happens through journalling is you find your true self and your bliss even if you thought you might be blissless! We all have moments of true joy, putting it down brings more awareness and more moments. It is all about the play! Always follow the JOY! Debra, CEO!